NOTE: What follows is Jerry’s complete article on Polyrhythm Clocks. An edited version that focused on only “Part I” was used for his 2016 BTOT presentation. 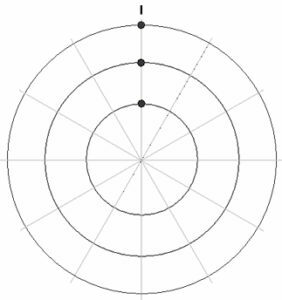 This article examines polyrhythms that are represented in two visual forms: western notation and as a clock image. Examples are adapted to playing the drum set, but can be applied to any array of instruments. The word “poly” is of Greek origin and means “many.” A polygon has many sides, and polytextual music is set to two or more simultaneous texts. Experienced musicians are familiar with playing 3:2 combinations using the hands. 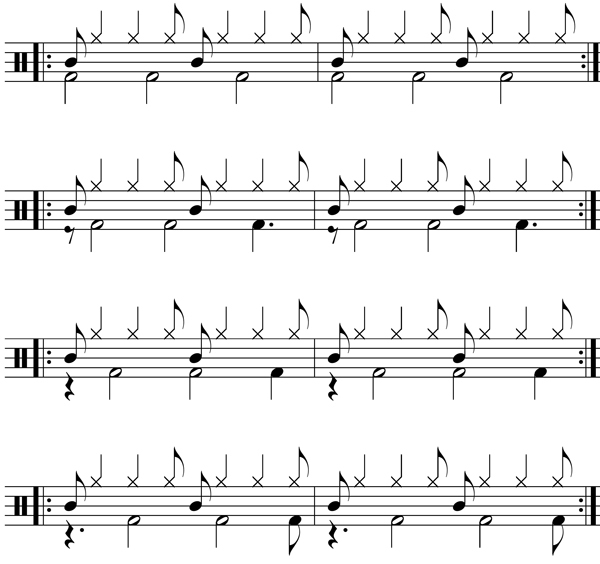 A famous holiday classic “Carol of the Bells” features 3:2 in the melody, and numerous examples exist in jazz and nearly every style of world music. I begin this study with a more intricate 4:3:2 orchestration. Applying three simultaneous polyrhythms may seem daunting, however because “2” is half of “4” their consistent relationship helps to unify the patterns. 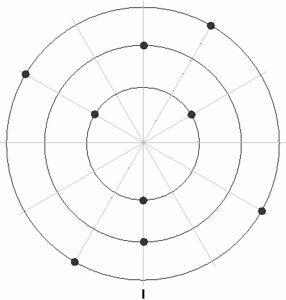 Each polyrhythm fits into one bar of musical time—12/8, 5/4, or 7/4. A second bar is included for the mind to process the phrase before the “repeat” sign. 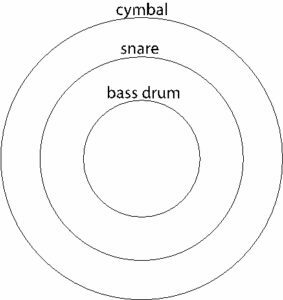 For the examples presented in Part I the bass drum is in 3, the snare in 2 and the cymbal in 4. Notice below that the cymbal pattern has been displaced to the “off-beat,” which creates more syncopation to the snare. The 4:2 relationship of the hands is consistent regardless of their rhythmic displacement. As shown below, the outer circle of the clock is the cymbal pattern, the middle circle is the snare, and the center circle is the bass drum. 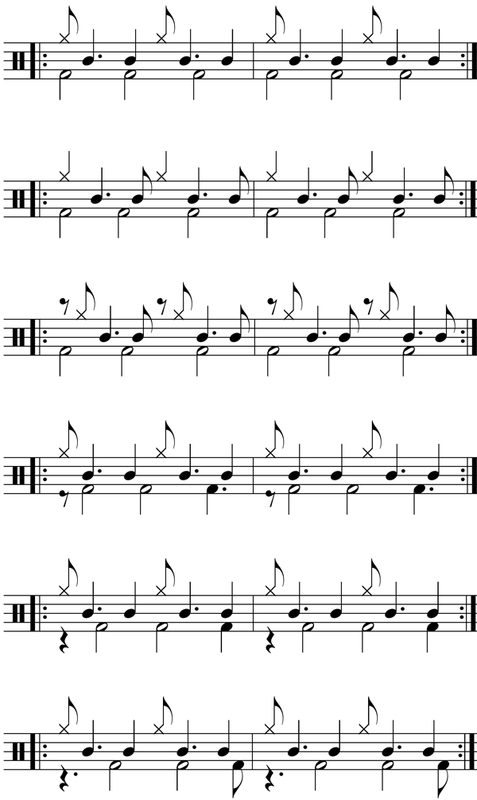 The three limbs are stacked from high to low (outer to inner) in a similar manner to the western notation. 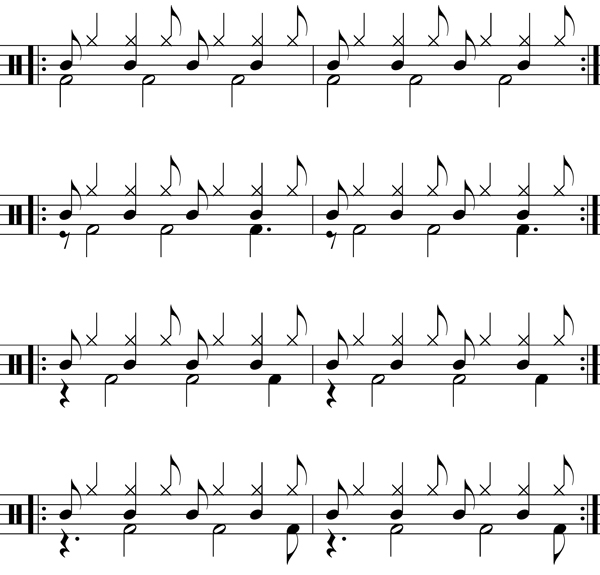 Western staff notation incorporates note heads to represent pitch and duration. In the clock notation “dots” will serve a similar function. 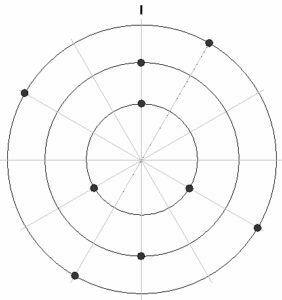 Since we are examining polyrhythms that are evenly displaced inside a bar of musical time, the dots will be evenly spaced on each gear of the clock. 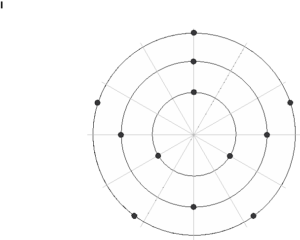 Shown in the image below are three dots positioned at the top of each line to mark the downbeat—beat “1.” Also shown are 12 lines that represent the 12 points (digits) of the clock image. Above the clock where the “12” would appear is a “hash mark” that marks the beginning of the phrase. Given that we will rotate the image to create new variations, this mark will indicate where the original phase began. By presenting examples in 12/8 meter, the twelve digits of the clock—although not actually included—can be easily imagined. 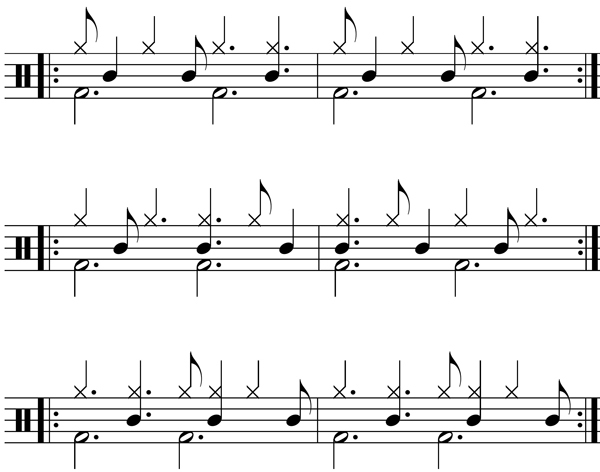 Shown in Clock #1 is the same 4:3:2 translated into clock notation. Notice that there are no actual “clock hands” to the image, like those found on a traditional time-keeping device. This is where we start to visualize the actual “gears” from inside the clock, as if both the “face” and the “gears” were visible at once. Ultimately, it is the combined sounds of the drum set that create reliable timekeeping. Play the rhythm while following along with the three “gears” to unlock this new type of visualization. Example 2 takes the previous phrase/gears and rotates it to a new starting position. This was achieved by shifting example 1 to begin from the second attack point. In the western notation the first cymbal hit that was positioned on the “off-beat” is now set to the downbeat. As a grouped unit, the snare and bass drum have also moved back in time by one 8th note. Even though the limbs are playing the same pattern the mind must reconcile it to the new downbeat. Example 2 comprises a “swing-like” quality, whereas #1 had more of a “world music” quality, like an African groove. In the image below, the previous clock has been rotated counter-clockwise by a single digit—the “hash mark” from 12 o’clock is now set to 11. Compare clocks 1 & 2 to grasp the rotation principle that will be used throughout this study. There are five more rotations presented using the same phrase, for a total of seven positions. Seven is based on the number of unique attack points from example 1. However, five more challenging positions are possible by starting each one with a “rest” on the downbeat. Example 3 follows the same rotation principle. Clock #3 positions the hash mark to 8 o’clock. In subsequent examples, the notation and clock will continue to move until the phrase returns to its original starting point. Although they are built with the same limb mechanics, the previous seven examples comprise unique syncopation and personalities. Some of them have subtle jazz-like qualities while others seem more world-music influenced. Advanced Exercise: Repeat example 1 eight times then try to realign your downbeat reference point without stopping as you progress from example 1–7. Play each phrase 8 times before transitioning. This will help you gain control of your internal gyroscope to flip phrase positions at will. The seven examples that follow have the identical snare drum and bass phrases from Part I. However, the cymbal now moves from a steady 4-pulse to a steady 6-pulse. In this configuration the 6 of the cymbal and the 3 of the bass drum share a ratio relationship that remains consistent within each example. Naturally, the outer ring of each clock contains six dots. Part III contains an assorted collection of 4:3:2, 6:3:2 and 6:4:3 phrases that will further challenge your developing skills. The goal was to shift the bass drum to different positions within the phrase, thereby altering the player’s center of gravity to achieve more cognitive stability. Even though there are no clocks included with these examples you can imagine them as you play, or draw your own abstract visualizations. Many more phrases are possible by switching the patterns played by each limb. Part IV now assigns the pattern in 2 to the bass drum and the 3 to the snare. In these examples the cymbal in 4 does not shift from its downbeat position. You are free to improvise variations and build your own collection. Indian syllables are provides for example 1, and four clocks coincide with examples 1–4. 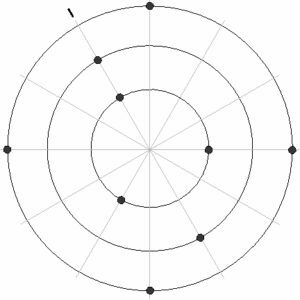 Part V enters a more advanced arena of polyrhythm and phrase rotation using 5:4:3 limb combinations. For these, the 5 is assigned to the cymbal, the 4 on snare and 3 on bass drum. Unlike the previous examples where the 4:2 and the 6:3 were ratios of each other, the 5:4:3 series contains no ratio reference points. The geometry has become more complicated to grasp, the musical examples more difficult to play, and the clock image more intricate to visualize. However, the rules from before have not changed: we are still applying evenly spaced attack points contained within one bar of musical time. Each limb establishes its own continuum that is woven into the other two parts. Finding an unencumbered steady flow will take time to develop. Required is an absolute “freeing of the mind” to eliminate all tension and pattern familiarity. In essence the player must fight the urge for the hands and feet to land somewhere familiar, to accept the new rhythmic truth that will ultimately set you free. We begin by examining the 5:4 pattern played by the hands. Strengthening this combination will help you to incorporate the bass drum in 3. 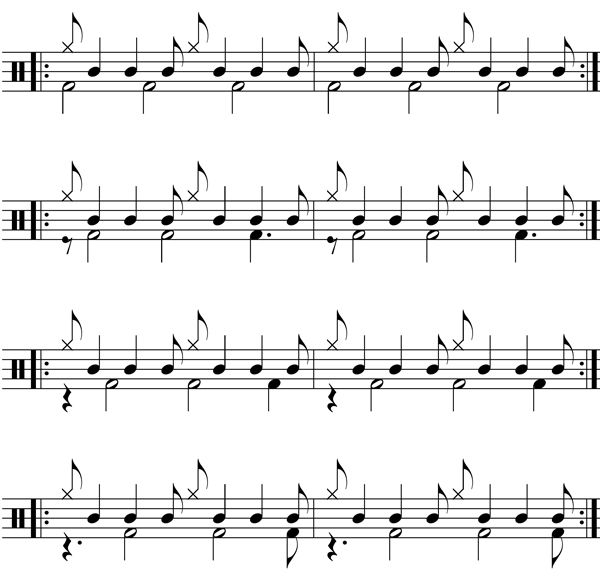 The polyrhythm is notated in 5/4 meter with both parts beginning together on the downbeat. In essence we are placing 5 groups of 4 on top of 4 groups of 5 for a total 20 pulse-units each. As shown below in example 1 the cymbal is playing steady quarter notes that glue all three parts together. The snare establishes a counter pattern that is based on 16th note counting theory: 1 e & a 2 e & a etc. Because the snare is rendering a series of five 16th notes it is pushing the next strike forward in time by one 16th note from the previous. In this way, the snare attacks follow an expanded version of 16th counting theory—1 e & a—as shown below with bold underline. 5:4 is notated in 5/4 meter. 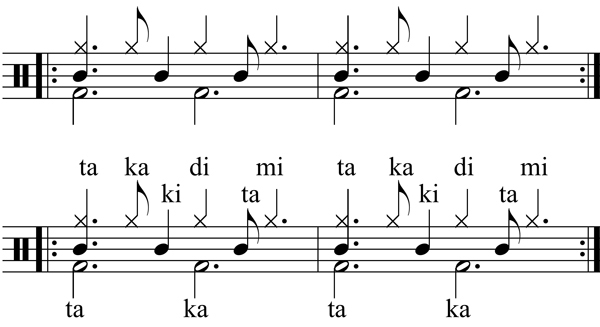 The second bar includes South Indian syllables with the 5 spoken as ta di ki na tom (“tomb”), and the snare in four spoken as ta ki di mi. The more intricate combination occurs with the cymbal in 5 over the bass drum in 3. This would logically be notated in 15/8 (5 x 3 = 15). Using triplet counting theory the bass drum in 3 adheres to a pattern that is shown in bold underline: 1 & a 2 & a 3 & a 4 & 5 a & a. Example 2 places this into the notation with Indian syllables. Now we are ready to explore five variations using 5:4:3 combinations. In western notation you will notice that the cymbal and bass drum do not change their positions. It is the snare drum that shifts forward by a consecutive 16th note. Snare rotations will adhere to the same 16th note counting theory even though its phrase will start from a different place. Shown below are the five variations using counting theory, with bold underline indicating the rotating snare position. Notice the consistent angle of each highlighted series, and how the 5th example ends with the last 16th highlighted. Refer to the video links for all examples, including these more intricate 5:4:3 combinations. In the link I describe the subtle “lilt” that occurs when combining a binary pair in 5/4 (cym / snare) with a ternary pair in 15/8 (cym / bass). An important aspect of the rotating snare against the consistent bass drum is knowing which strike comes first when they are very close together. 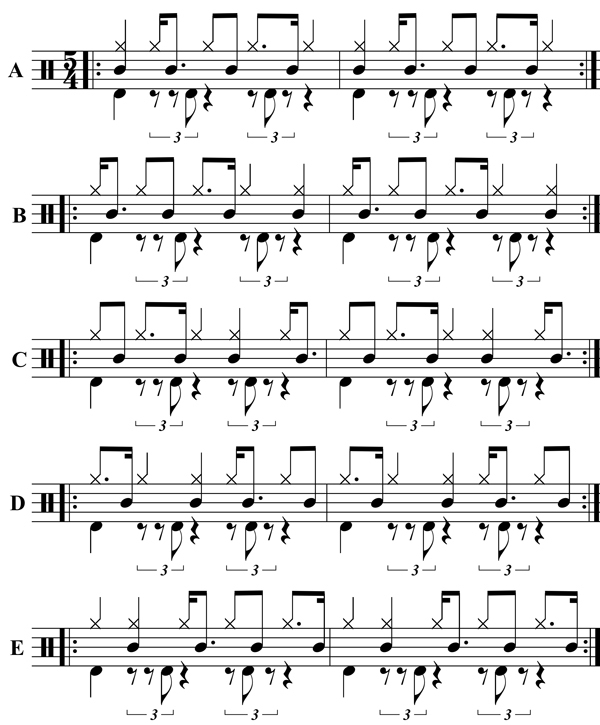 In example 3 below let’s focus on variation C. In the second beat of letter C the off-beat bass drum and snare appear to coincide when in fact the bass drum hits just slightly before the snare. As you navigate through these challenging phrases, there are several instances of “tight flams” that occur. The clock of Example A contains the most elegant gear arrangement contained in this article. As previously discussed, the 4:3 snare and bass strikes land on fixed straight lines. 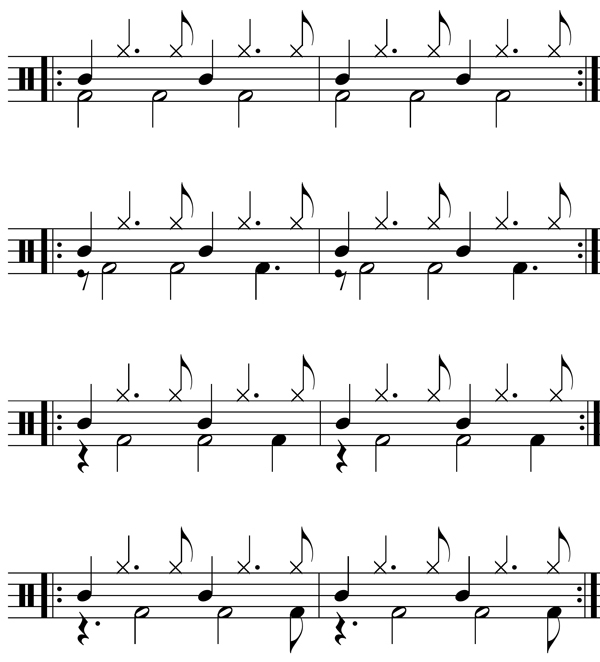 However, other than the first beat the cymbal in 5 does not land on any other lines—5 cannot evenly divide into 12. 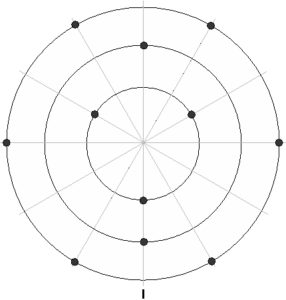 Study the outer circle in 5 and its relationship to the 12 lines. Try to “feel” the fractions from the right side of the clock to the left. A consistent mirror-like pattern does exist. As shown in the clock image below, a three-tiered cascade occurs on both the east and west quadrants. On the east/right side the second cymbal strike flows into the second snare strike, which flows into the second bass drum. This is where the three elements break apart to begin their 5:4:3 polyrhythms. On the opposite side at the west/left quadrant is an exact mirror of this pattern. 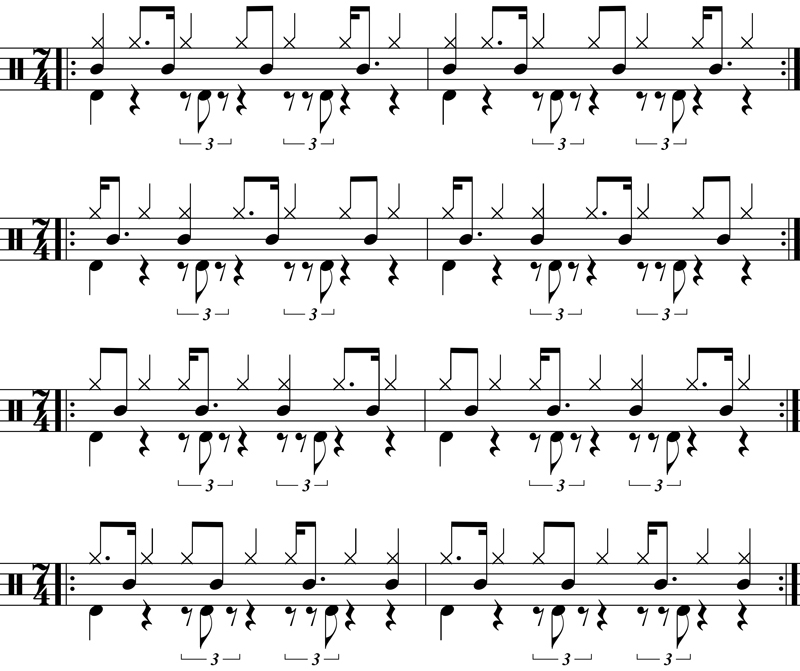 The 3rd bass drum strike leads into the 4th snare strike before finishing with the 5th cymbal strike. East and west quadrants form the proverbial “wings” of a new kind of image. 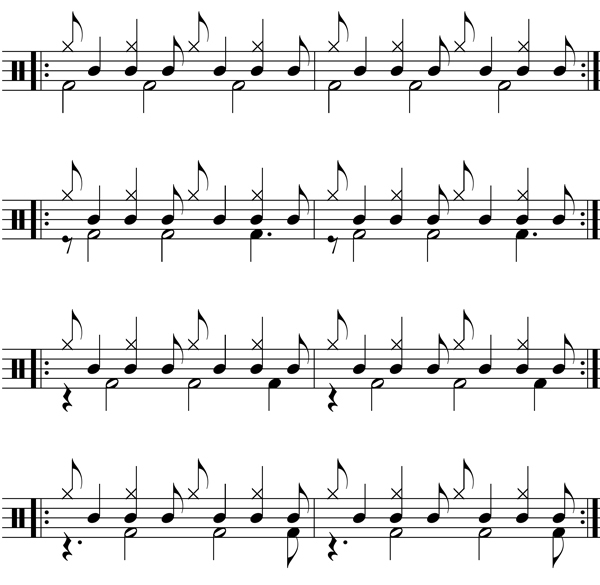 The “bird in flight” is completed as the three simultaneous elements on the downbeat function as the “head” with the balanced “tail” shown at the bottom. 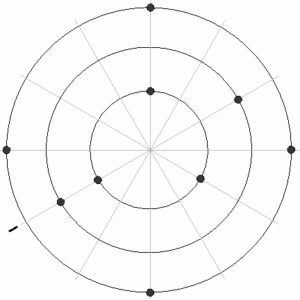 We can expand the 5:4:3 principle to new levels by building a 7:4:3 polyrhythm. 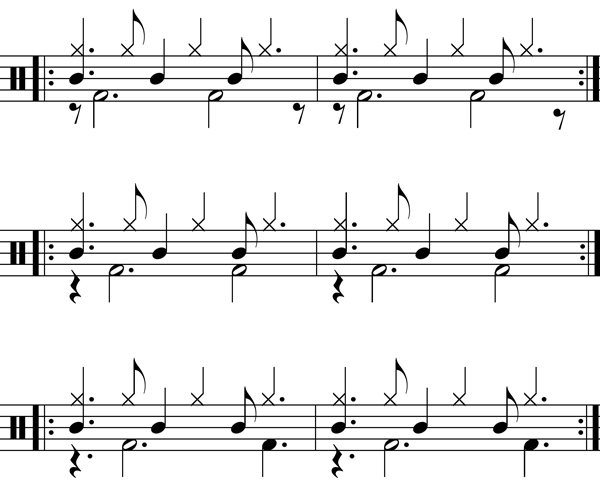 The previous 4:3 snare and bass variations will be applied to a quarter note cymbal in 7. Begin with the hand combinations in 7:4 that also abide by the rules of counting theory and phrase rotation. Polyrhythms have probably existed since the beginning of “music” in the history of the human race. Some are subconsciously filtered into the mind and body of the musician, while others require detailed analysis and practice to master. As a drummer it felt natural for me to orchestrate three simultaneous polyrhythms, to discover what is humanly possible and musically unique. 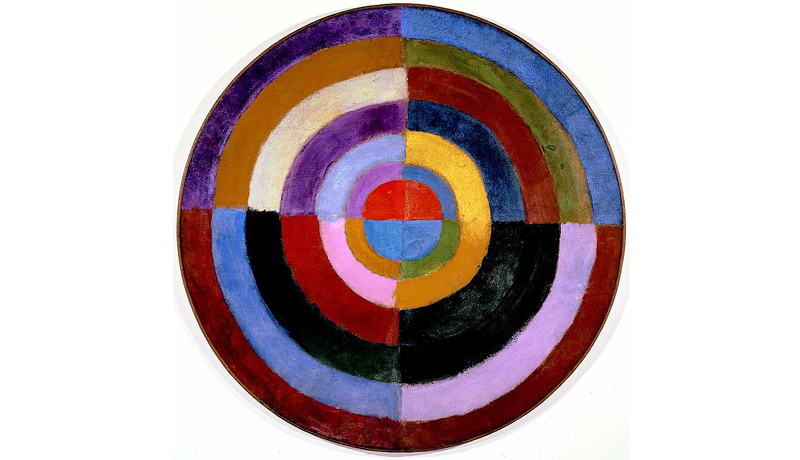 The use of abstract images to represent a musical idea is not a new concept. The Ragamala Paintings from medieval India depict various musical modes known as ragas. Each raga is personified by a color, mood, a verse describing a story of a hero and heroine. It also elucidates the season and the time of day and night in which a particular raga is to be performed. The South Indian Yatis depict visual shapes through rhythmic patterns. The Mrdanga Yati is based on the barrel shape of the Mrdanga drum that starts small at the end and grows in size before reducing back down to its starting point. African bell patterns have been set into motion in circles and graphs with entire ensemble patterns illustrated using symbols placed inside a box-like grid. Abstract graphic notation made famous by 20th century composers represents music through the use of visual symbols outside the realm of traditional notation. The polyrhythms in this article, when depicted as a clock with three gears working in concert, take on an artistic quality that is more visual and creative to interpret than the western notation. Delaunay, Robert. Premier Disque. 1912-1913, Private collection.